Retail Man Point of Sale software converts a PC into a powerful Point of Sale terminal by attaching POS hardware such as a docket or receipt printer, a barcodescanner, cash drawer, customer or pole display and scales. A programmable keyboard may be useful for busy systems. The image to the right shows some typical equipment. Various makes and models of hardware are supported by Retail Man POS. Ezi Solution recommends that customers find out about availability, support and compatibility of hardware by contacting local suppliers. Please see the summary of supported POS Hardware. 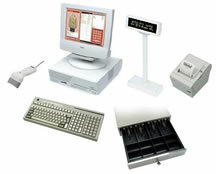 Some typical examples of POS hardware are listed below.